My academic Twitter-verse has been in a bit of an uproar today about recent articles in The Chronicle of Higher Education and Inside Higher Ed on graduate education in the humanities. These articles include reports on MLA President Michael Bérubé’s talk at the Council of Graduate Schools (and here); Stanford’s plans to redesign humanities graduate programs so students can graduate in five years; and beyond depressing employment numbers for recipients of doctoral degrees, especially in the humanities. In other words, graduate education in the humanities – and, more importantly, what we should be doing to fix it – is still a Hot Topic of Discussion. But, as many on Twitter have pointed out, redesigning graduate education itself can only go so far in addressing the “jobs crisis” in the humanities. As I wrote about on this site, the issue is systemic – it’s not just about reducing time to degree, offering summer support, or trying to train students for jobs outside of academia. It’s about the exploitation of the academic labor force: the ever-dwindling numbers of tenure-track jobs (or academic jobs that offer salaries and benefits…), and the ever-increasing numbers of contingent faculty that teach ever-increasing numbers of students. Piper’s point here made me stop and think. Is there a correlation between labor and disciplinary problems in the humanities? I had always seen the two as interlinked; disciplinary concerns like the specific content of graduate programs in the humanities always seemed closely (if ineffectually) related to the issues confronting the graduates of those programs on the academic job market and beyond. Had my position as a humanities graduate student about to step into the abyss next year – I mean go on the job market – clouded my judgment regarding this relationship? This exchange also reminded me of the discussions we are currently having in our 4Humanities@UCSB local chapter about defining humanities values for advocacy. Part of our current work for this group involves sitting down individually to put into words the values we think best frame the humanities for advocacy (see a Prezi of Alan Liu’s first draft here: http://prezi.com/-bnzbmh5bu4o/humanities-values/). I have tried to do this several times now and have failed to produce much of anything. What makes this task even more impossible for me is that it brings up all kinds of questions I don’t really know the answers to, including what exactly 4Humanities is advocating for and who exactly our audience(s) is/are for this advocacy. Are we advocating for a greater appreciation of the humanities among “the general public?” For greater institutional support for the humanities in the university? For greater awareness of the exploitation of contingent faculty and the structural problems of academic labor? Should we start at our own universities first? How can we be an “international collective” if we do that? The questions continue. 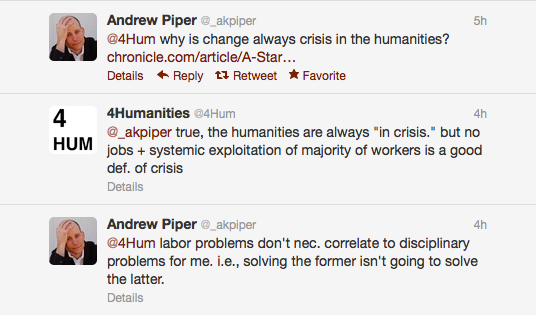 I bring all of this up because Piper’s point about the correlation between disciplinary problems and labor problems – and the greater discussion about the content, structure and purpose of graduate education in the humanities – seems to get at the heart of the difficulties I am having with defining the role of 4Humanities in advocating for the humanities. This difficulty has to do with the connections between the issues confronting specific humanities disciplines at specific institutions and the greater systemic issues facing higher education, particularly in the humanities, today. For example, is advocating for increased financial support for the humanities, or for streamlining specific humanities graduate programs, or for the importance of the digital humanities, related to raising awareness of the systemic problems of academic labor and to advocating for academic workers’ rights? And if so, how? My inkling is that in order to confront – or at least have a conversation about – huge issues like academic labor, we need to be able to discuss connections between the local and the global, the specific and the systemic. It seems imperative that we here at 4Humanities ask ourselves how our efforts in advocating for the humanities can work to make these complicated connections visible. I can’t see how disciplinary problems would not be intimately related to labor problems. If one cannot financially stand on two feet, it’s going to be extremely difficult to think about how to conceive of and perform (let alone effectively communicate to the public the value of) quality work. I don’t think that solving labor problems solves disciplinary problems, but it seems impossible to ignore the impact labor problems have on any discipline.